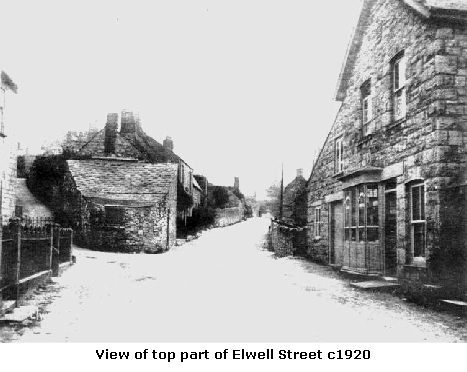 Elwell Street was the shopping centre for Upwey, with a butchers, shoemenders, grocery store, wet fish shop, a barber’s, coal merchant and Post Office. 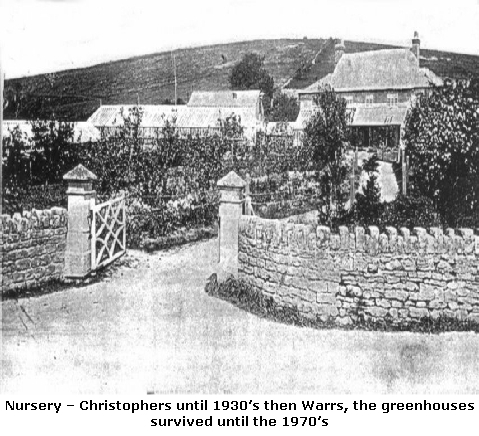 There were also a couple of market gardens where fruit and vegetables could be bought and the Poultry Farm on Little Hill for eggs and chickens. Number 60 Market garden behind a high wall. 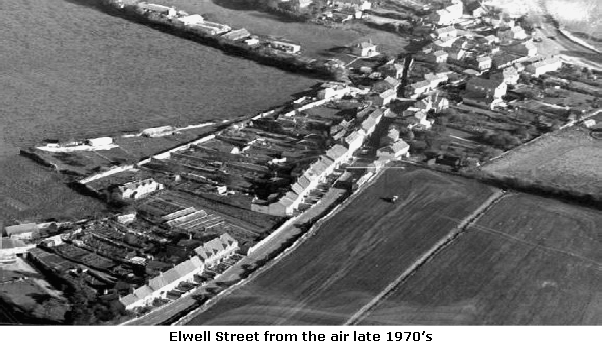 Site redeveloped in 1987 with 4 houses. 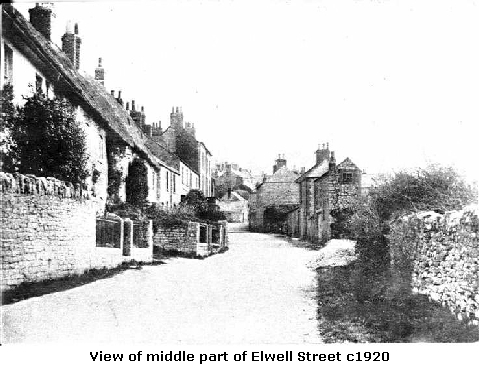 During the 1920’s and early 30’s the families living there included Povey and McKay. From approx 1938 until just before demolition in 1987 the Hare family were there. 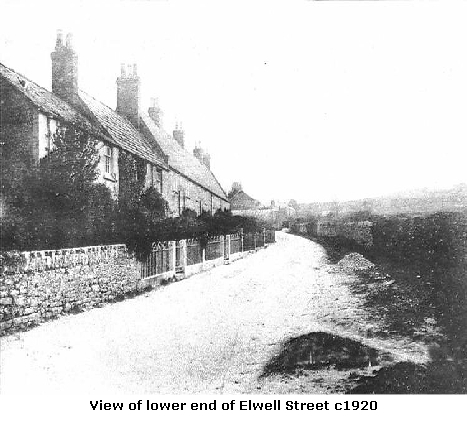 They were market gardeners using that land and further land opposite the Mason’s Arms in Church Street. 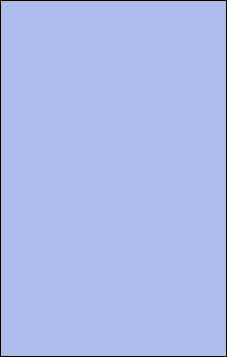 Number 20 Jack Willis – Haulage from apx 1946 to the 1970’s. A house was built on the site in the 1980’s. Number 2 original post office – early 1900’s. The late 1970’s was a turning point for this shopping centre, as owners retired or passed away, the shops were closed and converted to residential use. A change in shopping habits and competition from supermarkets made running a local shop a struggle. Adjacent to 88 Elwell Street was the ‘Reading Room’. Built of corrugated iron/brick it was built as a meeting place for the young men of the village in 1906. It was also used as a polling station and as a home guard base and classroom for evacuees in the Second World War. Later it was used as a hay store by the farmer. In the 1970’s a fire broke out and the hut burnt down. Almost opposite the grocers, at number 25 Mr Hansford could be found mending boots and shoes. 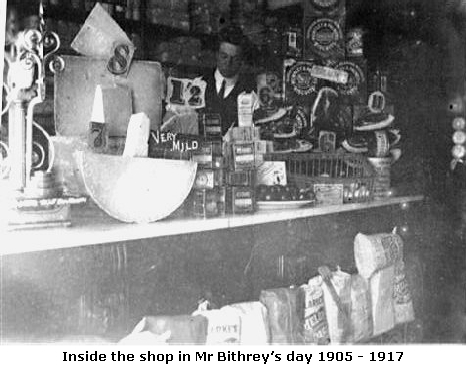 A few doors down at number 40 was the butchers shop run by Mr Bowditch, when he retired Mr Lovering took over offering a delivery service. In 1978 changes required under health and hygiene laws proved uneconomic for Mr Lovering to adopt and he decided to retire. The premises were sold and no longer used for commercial activity. A little further up at number 28, Mr Wagstaff sold wet fish and fish and chips on one or two nights a week. Mr Wagstaff moved to shop premises at Littlemoor in the early 1960’s, keeping an Upwey connection by providing an ‘order and deliver’ service. Jimmy ‘the barber’ took up residence for a while, moving from a hut at Gray’s Corner. In June 1973 planning permission was given to make changes to the former hairdressers to use as private workshop and store, including alterations to the windows and entrance. 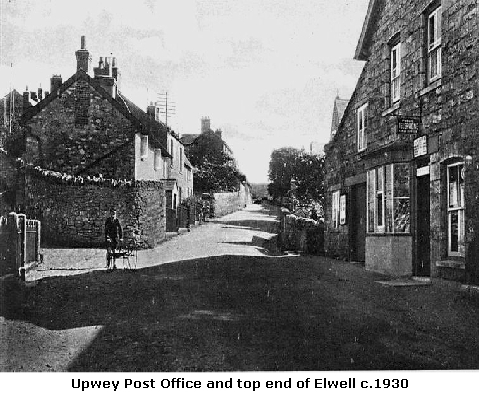 Upwey’s post office was originally at what is now 2 Elwell Street. 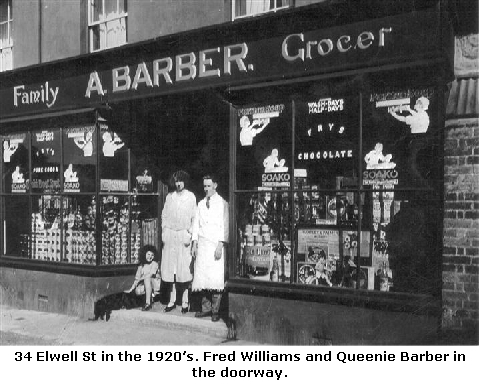 By the 1930’s it had moved to 17 Elwell Street which was previously a stationers. 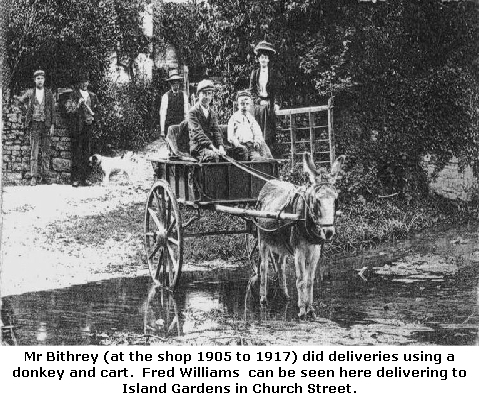 Miss Corbin, the postmistress, and delivered by one of the three postmen who covered the villages in the area. 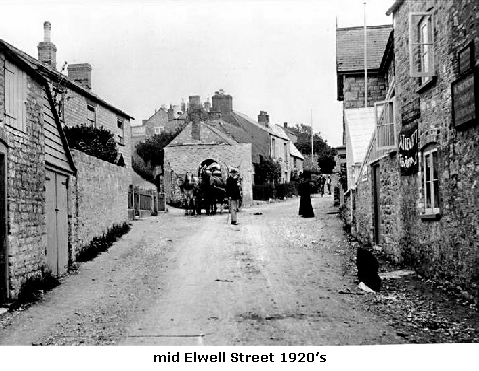 Miss Corbin came to the village in 1890 when her father became sub-postmaster, and took over from him in 1905. Miss Alice Dunn, came to assist in 1922; became sub-postmistress following the death of Miss Corbin in December 1956 and remained so until her death aged 80 in 1977. In the 1960’s/70’s she was assisted by the Misses Wills. After Miss Dunn’s death Mr Eckersall (at 84 Church St) took on the post office duties. In 1980 the property was converted to residential accommodation. 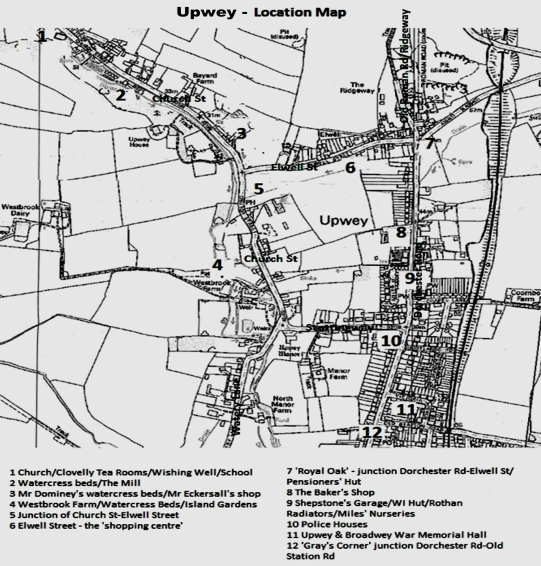 Upwey lost its post office when Mr Eckersall died in 1979 and Broadwey Post Office at Gray’s Corner was the nearest.